This is one of the best times of the year to learn your way around the flats as there is considerably less traffic in the fall than at other times of year. Fishing has to compete with a lot of other activities and the fall has its draw for our northern visitors. Kids are starting back to school, the weather is improving, the fall colors are coming up and the holidays need preparing for. All of these activities keep people off of the water. That is very good news for the rest of us. With the possible exception of a passing tropical system the weather is also nicer for those of us who choose to stay and explore the shallows of the Keys. Less traffic means less spooky fish and comfortable fish are more easily approached. Finding fish is only the first step in fishing the flats. Your presentation is as important to the catch as is finding the fish. A little noise or a poor cast can send fish heading for the proverbial hills or in our case the nearest channel. Learning to cast as softly as you speak is a valuable skill. Landing a crab or shrimp with little splash and noise translates into a lot less refusals or spooked fish. The angle of your cast as well as the timing of your release will determine the arc and velocity of your bait as it enters the water. If you release your bait too soon during your cast it will fly high in the air before it settles down into the water and the terminal velocity of the falling bait creates a noisy splash. The inverse is true when you release the bait too late. The velocity of the directed, arcless bait is going too fast and you guessed it – splash again. Release the bait perfectly and the bait lands with as little fanfare as possible and there is less chance of spooking your quarry. While an aimed overhead or over shoulder cast is the easiest to master for accuracy the side arm cast is one that you should spend considerable time mastering. By starting at a lower angle it will allow your bait to land more softly and thereby providing the softest presentation possible. The side arm does take more practice to master than the overhead for accuracy as there is no forgiveness in the accuracy department for a poorly timed release. Choosing the right size bait for the fish that you are after is another important decision to make. Shrimp and crabs can be more difficult to procure in the fall. Many bait shops have trouble stocking larger shrimp until the water starts to cool. Fortunately bonefish are not as fussy when it comes to live bait as you may think. If you have trouble finding bait large enough to cast it is not unacceptable to double up on your offering to get the right weight to cast your line. Adding a weight is another good option. Adding a split shot near or better yet at the bait is a better option for farther casts and softer entries. Keeping the weight separated from the bait only allows for two splash points and twice the chance of your presentation being refused. A separated weight also has the chance of snagging bottom as the fish starts to move off with your offering. At that point the likelihood of the fish spitting out the bait before the hook is set is very good. You can also buy weighted hooks that work well for the purpose. I do however, prefer more subdued colors mimicking that of the shrimp that you are using. Using a skidder jig to present your bait is a good choice. If you lose your bait there is still a good chance that the jig alone will get the job done. Large shrimp when available will often work for both bonefish and permit. The schools of smaller permit often seem to take on more of the behavior of their jack cousins than that of the large persnickety permit. Smaller schooling permit are more aggressive and tend to compete for any bait thrown their way. 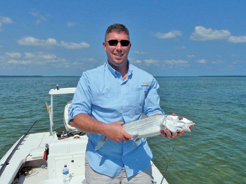 Smaller crabs are often great for both permit and larger bonefish. The classic silver dollar size crab is ideal for the large permit but may intimidate smaller fish. Smaller crabs also tend to land more softly increasing your chances of the fish accepting your offering. Fish like water moving over the flats and they tend to feed more aggressively when there is a lot of sheet flow over the flat to move bait. Another benefit to fishing the fall is the larger tides. The fish take advantage of these higher highs to feed in areas that they would otherwise not be able to access. Likewise we are able to follow them to flats that would be otherwise too shallow for our flats boats to follow. As an angler you need to be extra cautious to not get stranded on these extreme tides as it will be quite a long wait for the next higher tide to float you off. Remember that the subsequent high is often as much as a whole foot less than the previous extreme high. Waiting twenty four hours to get off of a flat is not going t be fun in anybody’s book. Try not to get side tracked with preparations for parades so much that you neglect to get out on the flats for some of the best action of the year.